Napiers first shop and clinic was opened in Edinburgh in 1860 by Duncan Napier, a respected botanist and herbalist. Today the company still manufactures some of Mr Napiers' formulas and tonics using traditional methods. Over the past 150 years, Napiers has become the UK's leading force in complementary and natural health care, dedicated to the best of health and wellbeing through the use of herbal medicine and other Natural Therapies. A history of Napiers, written by the father of one of the present owners and available as a paperback, makes fascinating reading. It brings to life the remarkable story of Duncan Napier and is a graphic account of the development of British and American medicine and of Scottish herbal medicine in particular. In 2007, Dee Atkinson, Medical Herbalist and director of Napiers, was named one of Tatler Magazine’s top 250 private doctors in the UK. Today the company has one of the largest teams of professional natural health and herbal practitioners in the UK. Napiers manufactures a wide range of practitioner-quality, benefit led products available to consumers from the Napiers website. 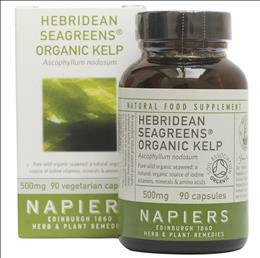 In 2010 Napiers introduced its first Organic Kelp product in co-operation with Seagreens - Napiers Hebridean Seagreens® Organic Kelp is a vegetable capsule containing 100% Hebridean Seagreens® wild Ascophyllum seaweed harvested among Scotland's remote Outer Hebrides.